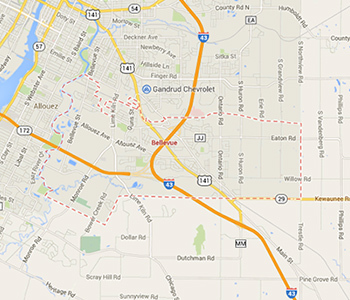 The town of Bellevue was established in 1856, and by 1874 the Allouez side split off and become their own town. It was a town until incorporating as a village on February 14, 2003. Visit the Village of Bellevue’s website to learn more about this Green Bay community and their servies. Bellevue has more than a few major parks. You have the more well known ones: Josten Park, DeBroux Park, and Willow Creek Park. All of these parks are quite popular in the spring and summertime. There are playgrounds, soccer fields, tennis courts, jungle gyms, and more. Each of these great parks also have reservable shelter space for large parties and get-togethers. In the summer, Josten Park has quite a few chili cook-offs and bands playing on the weekends. For more detailed info, click here. Looking for a park for your four-legged friends? Keep a lookout for a proposed dog park in Bellevue. With enough sponsors and donations, this dog park might be opening in the fall of 2014! Click here to find out all the detailed information. There are all styles of homes in the Bellevue area. You can find ranch style, 2 story, bi-level (raised-ranch), tri-level, and even the quad-level. No matter the style of home you’re looking for, it seems that Bellevue has got you covered. The past year 150 homes were sold and new people moved in. The average number of days on the market was 97. The average percent of homes listed that sold was 97%. Bellevue is bordered by Green Bay on the North, Allouez on the West, Ledgeview is to the South, and the East is the Town of Eaton. Interested in homes in the Allouez area — whether you want to sell or buy, contact Elysia today! 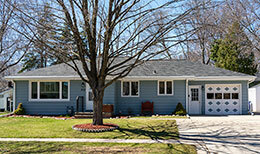 What Homes are Available in Bellevue, WI? New houses come on the market in Bellevue regularly so if can’t find that perfect house today, let Elysia know what you’re looking for and she can monitor the market and alert you when something meeting your criteria is listed. Click Here for a current list of Bellevue Homes for Sale.